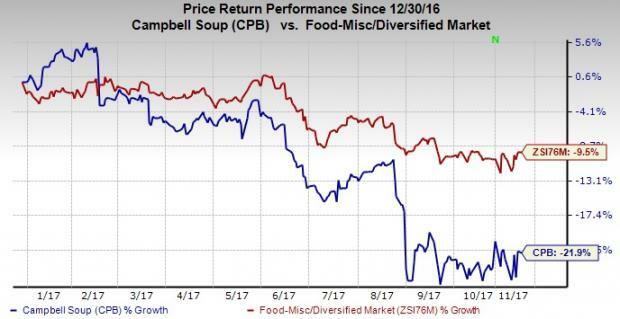 You are here: Home / Investors / Stock Analysts / Will Multiple Headwinds Hurt Campbell’s (CPB) Q1 Earnings? Will Multiple Headwinds Hurt Campbell’s (CPB) Q1 Earnings? Campbell Soup Company CPB is slated to release first-quarter fiscal 2018 results on Nov 21. The question lingering in investors’ minds is, whether this convenience foods behemoth will be able to come up with a positive earnings surprise in the quarter to be reported. The company missed the Zacks Consensus Estimate in the last two quarters. It delivered an average negative earnings surprise of 1.2% in the trailing four quarters. The Zacks Consensus Estimate for the fiscal first quarter is pegged at 97 cents compared with $1 in the year-ago period. Estimates have been stable in the last 30 days. Further, analysts polled by Zacks expect revenues of roughly $2.2 billion, down 1% from the prior-year quarter. Campbell Soup has been struggling to revive its top line, which hasn’t witnessed year-over-year growth for quite some time. Moreover, it has missed the Zacks consensus mark for three straight quarters now. Known for its canned foods, much of the sales debacle could be attributable to consumers’ changing eating patterns and their evolving preferences for healthy, fresh and organic food products. Nevertheless, the company’s Campbell Fresh (C-Fresh) division recovered slightly in the fourth quarter of fiscal 2017, after it was marred by lingering constraints related to the Bolthouse Farms Protein PLUS drinks recall in June 2016. These factors have also weighed upon the company’s shares that lost 21.9% so far this year, wider than the industry's decline of 9.5%. Further, the company anticipates the operating environment to remain challenging in fiscal 2018, wherein it expects to witness cost inflation. The company’s earlier guidance indicates that the first-half results will remain significantly soft. Additionally, stiff competition in the food industry and rising commodity prices might dent the company’s performance in the near term. Nevertheless, Campbell Soup is on track with its four core plans including focus on real food philosophy and transparency, undertaking robust digital endeavors, portfolio diversification and concentrating on growing its snacks brands. Meanwhile, the company is progressing well with its cost savings plan, which evidently helped it achieve gross margin, EBIT and earnings growth in fiscal 2017. So let’s wait and see whether these obstacles are offset by the company’s robust brand portfolio, solid cost-savings and four core plans. Our proven model does not show that Campbell Soup is likely to beat earnings estimates this quarter. This is because a stock needs to have both a positive Earnings ESP and a Zacks Rank #1 (Strong Buy), 2 (Buy) or 3 (Hold) for this to happen. You can uncover the best stocks to buy or sell before they’re reported with our Earnings ESP Filter. While Campbell Soup has an Earnings ESP of +0.70%, its Zacks Rank #4 (Sell) makes surprise prediction difficult. As it is, we caution against stocks with a Zacks Rank #4 or 5 (Strong Sell) going into the earnings announcement, especially when the company is seeing negative estimate revisions. The J. M. Smucker Company SJM has an Earnings ESP of +0.62% and a Zacks Rank #3. You can see the complete list of today’s Zacks #1 Rank stocks here. Ollie's Bargain Outlet Holdings, Inc. OLLI has an Earnings ESP of +1.82% and a Zacks Rank #3. Mondelez International, Inc. MDLZ has an Earnings ESP of +0.04% and a Zacks Rank #3. It's hard to believe, even for us at Zacks. But while the market gained +18.8% from 2016 – Q1 2017, our top stock-picking screens have returned +157.0%, +128.0%, +97.8%, +94.7%, and +90.2% respectively. And this outperformance has not just been a recent phenomenon. Over the years it has been remarkably consistent. From 2000 – Q1 2017, the composite yearly average gain for these strategies has beaten the market more than 11X over. Maybe even more remarkable is the fact that we're willing to share their latest stocks with you without cost or obligation.